Ambrose Church married Esther Larthall in Oct 7, 1883. David A. Simpson married Clara Church, daughter of Joseph Edward Church and Julia Allen, in Sep, 1881. Elizabeth Pendergast married John S. Church, son of Joseph Edward Church and Julia Allen, in Nov 21, 1870. George Young married Agnes C. Church, daughter of Joseph Edward Church and Julia Allen, in Apr, 1874. Esther Larthall married Ambrose Church, son of Joseph Edward Church and Julia Allen, in Oct 7, 1883. George O. Caldwell married Susan Finley in Oct 19, 1870 at Boston, Suffolk Co., MA, USA. Daniel L. R. Caldwell married Nancy Foster in Aug 13, 1873 at Berwick, Nova Scotia, Canada. Daniel L. R. Caldwell married Eva Crowe in Aug 19, 1884 at Truro, Nova Scotia, Canada. Paurela A. Caldwell married Stephen Ilsley in Sep 30, 1880. Ambrose V. Caldwell married Antoinette Jordan in Jun 2, 1885 at Bridgetown, Nova Scotia, Canada. Amy M. Caldwell married Frank L. Marble in Apr 20, 1887 at East Templeton, MA, USA. Sarah Smith married Noah Houghton, son of Daniel Houghton and Susannah Pierce. Susannah Price Houghton married Joseph K. Brown in May 21, 1826 at Pittsford, Rutland Co., VT, USA. Rosamond Nadine Houghton married John Delmar VanNoy in Dec 25, 1945 at Little Rock, Pulaski Co., AR, USA, Parsonage of the Methodist Church. Eliza (?) married Adin Houghton, son of Noah Houghton and Patty Fessenden. Henry E. Houghton married Mary Faught in circa 1865 mar 35 years in 1900 census. 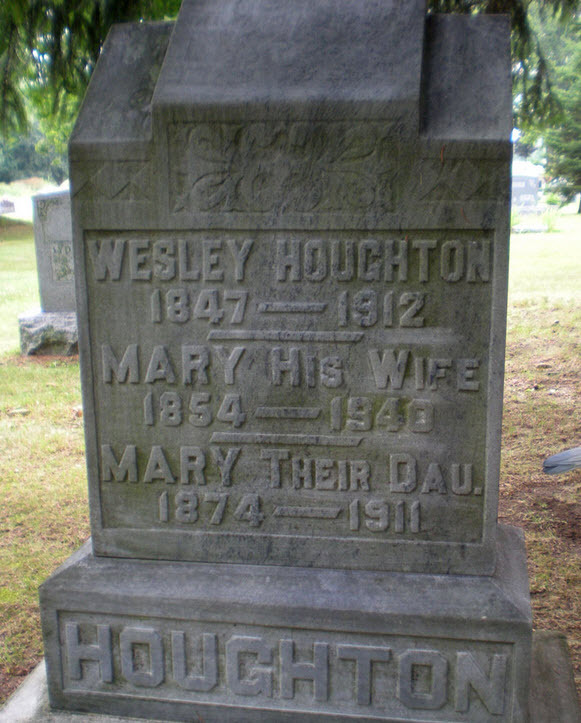 Wesley C. Houghton married Mary E. Carson in Jul 4, 1870 at Columbia Twp, Jackson, MI, USA. Mary E. Carson married Wesley C. Houghton, son of Noah Houghton and Sarah Smith, in Jul 4, 1870 at Columbia Twp, Jackson, MI, USA. Susan Finley married George O. Caldwell, son of Hibert Caldwell and Helen Pamela Church, in Oct 19, 1870 at Boston, Suffolk Co., MA, USA. Nancy Foster married Daniel L. R. Caldwell, son of Hibert Caldwell and Helen Pamela Church, in Aug 13, 1873 at Berwick, Nova Scotia, Canada. Eva Crowe married Daniel L. R. Caldwell, son of Hibert Caldwell and Helen Pamela Church, in Aug 19, 1884 at Truro, Nova Scotia, Canada.